The Maplex Label Engine attempts to place each label inside its polygon when you use any of the three interior polygon labeling styles. Sometimes labels will not fit within their polygons. In these cases, you can override the interior placement by using the May place label outside polygon boundary option. The Maplex Label Engine will first try to place labels that do not fit within their polygons outside the polygons, oriented horizontally and at the label offset distance from the polygon boundary. If this placement is still not possible, it will try positions outward from the default until it either places the label or reaches the maximum offset. There is also an option to only label the largest polygon in a multipart polygon. 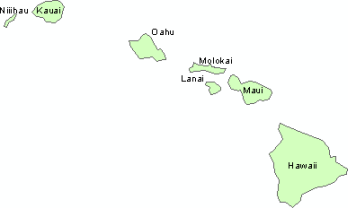 The following image shows the islands of Hawaii labeled using the May place label outside polygon boundary option. Instead of the smaller island labels going unplaced, they are offset outside of the feature. Check the May place label outside polygon boundary check box. Optionally set a label offset and a preferred external zone for placement.